I love Google! That's no secret. After having worked with Google products for a number of years and using them in my class I finally decided to get Certified. 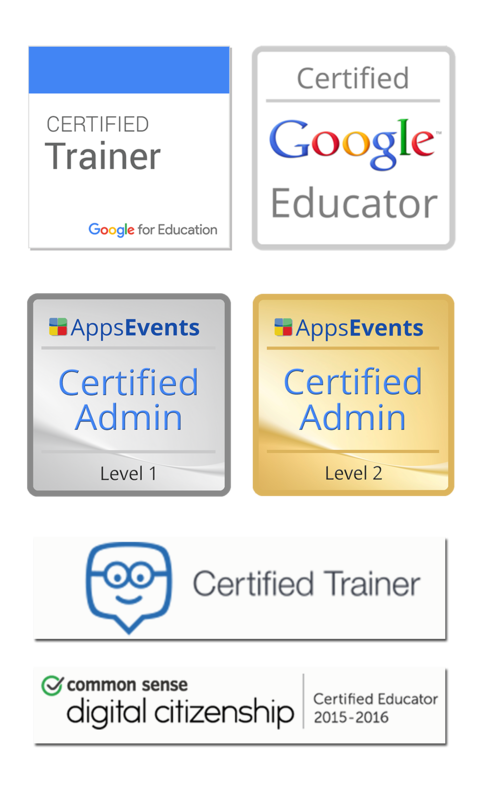 Now becoming a 'Google Educator' is actually not as difficult as you might think. The process is pretty straightforward and the tests are all done online. Before jumping into this you do want to explore the official Google Educator website as it contains all the information you need to embark on this journey. One of the most important skills you will need is the skill of 'searching for and finding the answers to questions'. We require this from our students on a daily basis, so you can look at it as a test to see if you are practicing your very own teaching. The Certification consist out of four required exams and one elective. The required tests are: 'GMail', 'Calendar', 'Sites' and 'Docs/Drive'. The electives are: 'Chrome Browser', 'Chromebooks', 'Google Play for education' and 'Android Tablets for education'. I decided to go for Chrome Browser as an elective as Chrome is the most frequently used browser in our school. Once you start preparing for the exams spend some time on the website mentioned above. Google has excellent training videos available and a glossary with all the information you might need. As I embark on this journey I will keep you posted and I will share my progress throughout these various exams. My aim is to complete 2 exams a week, hopefully completing the full course by the end of this month.